The weather couldn’t have been any better. Originally The Trembler Run was a much longer run taking us, starting from Bakersfield, to Coalinga and San Lucas. Then we would have headed south through very sparsely used country roads through beautiful countryside along the San Andreas fault; had lunch in Paso Robles and more cruising along little used scenic country roads where we were to do more sight-seeing and then home after a full day. Unfortunately the threat of rain and flooded roads canceled that event. 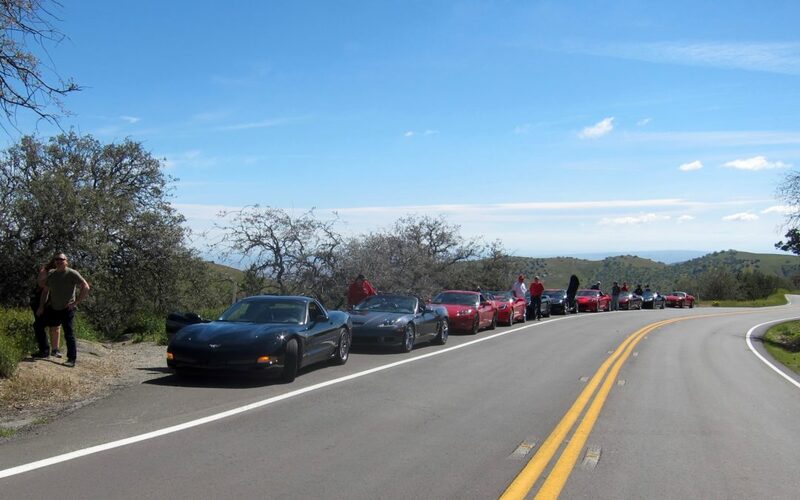 As a last minute endeavor to do something and to see wildflowers, 10 intrepid drivers (one in a Pontiac Solstice) made a last minute run through Hiway 58 straight through McKittrick to the Carrizo Plain National Monument. All alongside the road we saw an awesome display of God’s beautiful, colorful creations. We would stop to take pictures of everything from our cars to the multicolored mountain sides. Anytime you get a bunch of beautiful Corvettes together, you have an instant car show that attracts kids and adults alike. As a matter of fact, we had some beautiful and excited Asian gals all the way from Los Angeles taking pictures of our Vettes so we invited them to sit in one for a picture setting. They were very entertaining and had a great time. Afterwards we drove back to McKittrick to have a wonderful and much needed lunch and to recount what we had seen. We stopped at the McKittrick Hotel and Penny Bar owned by Mike and Annie Moore. In that rustic old building, established in 1898 and rebuilt in 1903, we saw a plethora of kitschy sayings, proverbs and artifacts but mostly we saw pennies…”Starting with a large bucket of pennies, the Moore’s begin decorating the bar, the walls, the sign in the front of the building, and just about any flat surface he could glue Mr. Lincoln. Over 1 million pennies later, the Penny Bar’s unique beauty has achieved a fame that has stretched from coast to Coast. Television and newspapers have done stories about this unique establishment which has brought fame to this icon of a very small Kern County town”.